Hearing aids may soon become a thing of the past for deaf people thanks to a device that may enable them to take in sounds through the sense of touch. Dr. David Eagleman, a neuroscientist at Baylor College of Medicine in Houston, has taken to Kickstarter to raise funds for his new invention, the Versatile Extra-Sensory Transducer (VEST), a device that converts and transfers sound in the form of electrical signals to the brain, according to the NY Daily News. 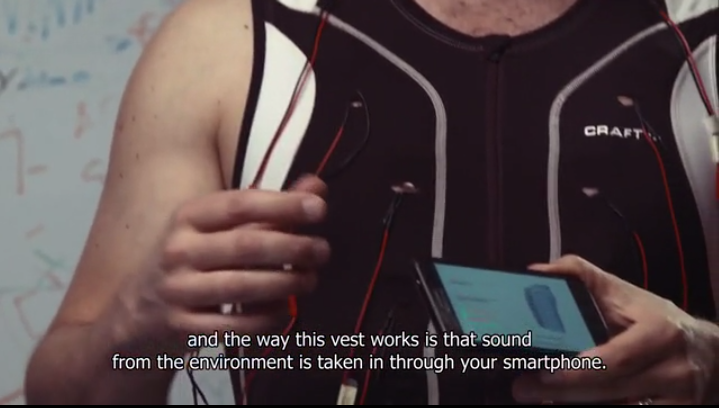 The device, designed as a wearable vest, uses a smartphone to absorb and process external sounds into data. The phone then transfers the information using blue tooth technology to vibration motors on the vest, which transfer it to the brain in the form of electrical signals, thereby replacing hearing with touch-based senses. “The brain gets the information from the torso and can figure out how to interpret that information,” said Eagleman in his Kickstarter video. Eagleman says that adjusting to how the vest works takes time, but that soon deaf people will be able to listen to music and hear the sound of traffic, tasks they cannot or have a hard time doing now. He is also experimenting with the concept of delivering other information, including weather updates, tweets, and stock market data, in order to update users on current events. “The idea is that you can become very worldly in a sensory sense,” said Eagleman at a Being Human Conference last year. The inspiration behind Eagleman’s idea goes back to 1969 when researcher Paul Bach-y-Rita conducted an experiment in which he strapped blind people to dental chair connected to a video camera feed. The chair had pushpins on the back that would take on the shape of any object in front of the camera, giving the patient a touch-based sense of what was being filmed. Rita, according to Eagleman, concluded that blind people were able to gain a visual interpretation of their surroundings through touch. Deaf people currently use cochlear implants to help them hear sounds and noise. Scott Novich, a graduate student at Baylor who is helping to launch the project, says cochlear implants are expensive and do not always work for many deaf people. The Kickstarter has currently raised $43,743, over $3,000 more than its pledged goal. The VEST is expected for release in May 2015 and can be pre-ordered now for $3,000.